The piece below was written years ago; since then God has given me a lot of opportunity to think about what worship means to me and to the church. I have seen some beautiful examples of worship and some that make me sad. I have had moments leading worship where the voices of the saints washed through the church, where I felt the Spirit move and the hearts of hundreds knit together by the simple act of singing to the Lord. I have had moments when I wondered if corporate worship has been so tainted by ego, showmanship and smoke machines that it borders on profane. 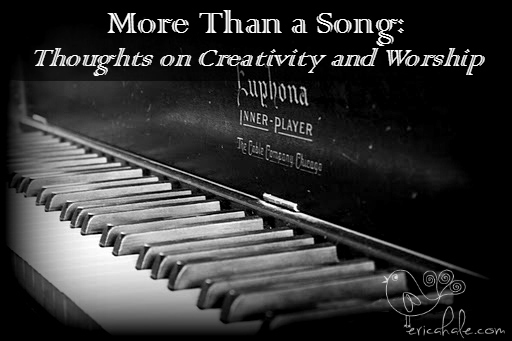 Through it all, one thing stands true: Worship is not a song. Worship is losing oneself in the act of giving back God’s gifts with sacrificial joy. True worship does not rely on a sound board and lights and PowerPoint displays. Those things are at best tools and at worst distractions. Worship does not need an audience. True worship takes place when the Spirit moves through the gift of creativity, whether it takes place on stage or in front of the breakfast dishes or on canvas or printer paper. True worship takes place when your heart is connected beyond words, beyond thought; connected in the Spirit with the Creator, and what flows out of you becomes so much more than the sum of its parts. I’m not saying that the current church model for worship is broken beyond repair. There is just so much more to it, and there are so many ways to let ego and self get in the way. When we do that, when we grab too hard to the wheel and forget Who is driving, we close the door to the miracle that happens when a song is lifted from simple notes and transformed into worship. We limit the profound gift that God offers us when we take His blessings (whether they are sung or played or painted or written or sculpted or spoken…any of the many unique ways He chooses to gift us) and turn them back up in praise to the One who invented everything that makes our hearts fill with awe and joy. Friends, I’m praying that each of us will find the blessing of true worship…in church and at home, at work and in the quiet deep of every heart. I pray that our worship will bless the Father who has been so generous in giving us the smallest fraction of His creative power, which puts to shame our greatest masterpieces and goes beyond our wildest dreams. It’s been with me since I was five, the antique upright piano. Its finish is deep ebony, the surface crackled with age, the keys chipped here and there like a well-worn smile. And when I can’t find the words, I go there and let the contents of my heart flow out in the pure form of music instead. So I’ve been there a lot lately, sitting on the bench with its worn white and green brocade. What I can’t find words for flows through my fingers on these different, more familiar keys. After all, I learned to play them before I learned to type, before I really even learned to write. It’s like slipping into a first language– the one you rarely get to use but often find yourself dreaming in. 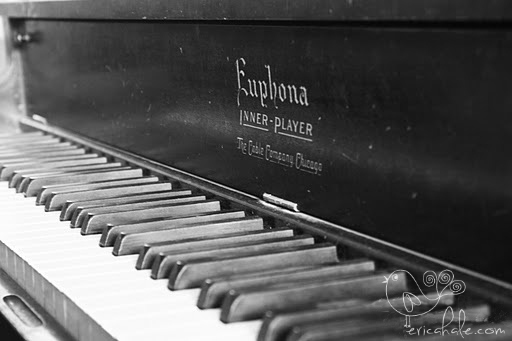 I play the old favorites I learned as a child; Beethoven, Haydn, Chopin, Brahms. I play new ones, hymns and worship songs and pieces I’ve picked up because I’ve always loved them. And I play what comes to mind and then through my hands, sometimes in such quick succession that I’m not sure where the music comes from at all…it moves through me and surprises me and makes me laugh, and makes me cry. Sometimes when no one is watching, I lean against the piano as I play, my cheek against the smooth black surface. I feel the music, the vibration of many strings against brass soundboard, resonating through old wood and flesh and bone. I feel the hum in my bones and soul and wonder: Is this how the Universe vibrates, with the echoes of the Creator’s voice….“Let There Be Light”…. humming through an infinity of tiny strings strung between all of creation that glows and breathes and sings? Perhaps true worship is simply playing in tune with Him. A Rhapsody on a Theme by El Shaddai, sung by a choir not bound by time or space or the limitations of flesh. Do you know these moments? When what began as poetry or paint or the pressing of black and white keys, the draw of a horse-hair bow across silver strings…becomes transfigured? When light falls in and through and lifts art from human hands to God-inspired, when every note or word or brushstroke is praise and you know, you know that there is more to it than ink or paint or notes splashed across five thin lines. And as the last note sustains and washes over you, you just want to stand there and raise your hands and whisper his name….Jesus, Jesus, Jesus. In Heaven, friend, that’s how it’s going to be. Every day, every word, every breath. Why we humans create, why there is art and music and poetry must be this: Our hearts were created after His own image, they long to hear the symphony and strive for those moments in which they resonate in perfect pitch with the Creator, in which they catch a glimpse, as in a mirror dimly, of the glory that is to come. And in that moment the soul understands that it cannot understand, only give in entirely to that which is incomprehensibly greater and more beautiful than we can imagine.